Interior airbags have become standard features in cars to protect drivers and passengers. But while the people inside the car may be safe in the case of a collision, pedestrians being hit by that car are still in a pretty bad position. Volvo wants to soften the blow of car-on-pedestrian accidents by introducing the world’s first pedestrian airbags as well as a whole suite of other pedestrian-related safety features. The Volvo V40 is a compact car that will help to cut down on pedestrian fatalities by keeping human bodies somewhat safe immediately following collisions. When the car senses a run-in with a person, an airbag inflates over the bottom one-third of the windshield. The back of the hood raises up at the same time, softening the blow and averting the pedestrian from the windshield. The shape of the airbag still allows the driver to see out of the windshield and hopefully steer the car to safety. 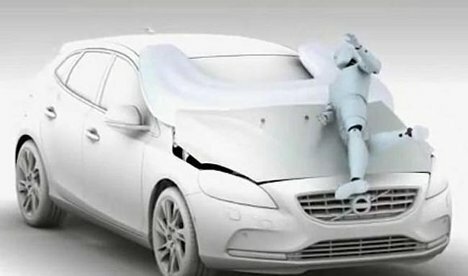 But the V40 is not just about protecting people when an accident occurs; it also helps to prevent those accidents. A pedestrian detection system sets off a loud noise and a flashing light inside the car when it is getting too close to a pedestrian. If the driver manages to ignore those warning signs the car can automatically apply the brakes to avoid a crash. The intelligent system even “watches” approaching pedestrians and predicts when one might step into the path of the car. See more in Cars & Trucks or under Transportation. March, 2012.